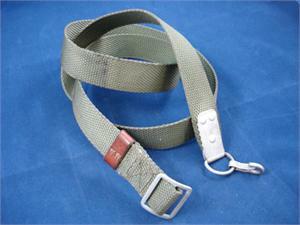 Polish AK-47 Sling, OD Green, Surplus used good condition. Has alligator snap on one end so it should be usable on SKS rifles as well. NOS, Complete: Unissued, excellent condition. Used, Complete: As described above and complete. Used, No Leather Loop: As described above but Missing the brown leather loop.